Some time ago I realized I did not have a certain common video game fever. I didn't care about one of the most popular elements of modern video games: the Achievement. Our last half-decade has seen Achievements swell in popularity, first on the Xbox 360, then on the PlayStation 3, the iPhone and beyond. Rivaling motion control, they have been video game's most popular 21st-century idea, growing from mere Microsoft-made bragging rights system to the life-improving badge scheme fueling the zeal for "gamifying" the world. Achievements long ago left me cold, before I discovered a better fantasy of my own. After experiencing a game that played sounds of applause for me when I did well, I decided that's a more gratifying way for a game to recognize me as a player than any Twitter-length alert of Achievement that drops a few points onto a virtual bragging board. But I never was into Achievements. Allow me, for a moment, to explain why I was ready for something new. From the start, Achievements elevated the mundane to the celebratory, doling 10 or 20 points to an Xbox 360 player in 2005 merely for finishing a level of a video game. As the years went by, game developers got more creative, rewarding points in a shooting game if you survived for a minute without firing a shot or, as a joke, for pausing the game. Some Achievements were absurdly easy; others absurdly hard. On the Xbox 360, points earned for Achievements in one game were added to an overall Gamerscore that represented, supposedly, the prowess of the gamer who had Achieved so much. The Gamerscore was as bold a bragging point as one's number of Twitter followers or Facebook friends. The score was also just as distorted from the reality it supposedly counted. Some people, lusting for points, sought games that had the easiest achievements. They packed their Gamerscores. I, and others, simply played our video games as naturally as we could. The Super Mario 3D Land fantasy is that there are people you can't see who care about what you are doing. My own naturalness was compromised, as self-righteous actions so often can be. My Gamerscore was as performance-enhanced as a homerun record, too. I'm a video game reporter. I get lots of free video games. I pop many of them into my Xbox 360 to try them out. Achievements are earned. Points are tallied, inflating my own Gamerscore into a number unequal to my actual passion for good video games. I have felt, nevertheless, that my Achievement score represented a more honest quantification of my natural habits of playing video games. It's an interesting, unforced number, sort of the video game equivalent to the tally of how many breaths I've taken in my life. Why the zeal for Achievements, I wondered? Then I thought: Who is there better to feel better than, than the people closest to you? People like when their actions are counted and when those counted actions total a number that is higher than the sum of their friends' actions. That's the message I got from Achievements, a built-in bragging system that, in a happier way, could simply be considered competition, the very motivator that sent people back to the arcade so many years ago to play more rounds of Pong and Pac-Man. In the last five years, I understood why game companies started including the number of additional possible Achievement points available in a new game expansion as a way to get people to buy it. I understood why PlayStation ripped off the Achievements idea and called them Trophies. (Nintendo dabbled with them but mostly avoided them possibly because people in the company might be philosophically opposed to them.) Achievements infiltrated computer gaming through Steam, iOS gaming through Game Center and other services, and fueled the Gamification movement with the promise that people might finally drop weight or feel motivated to go green if there was a points system attached to the micro-goals along the way. Quantifiable accolades for gradual progress, Gamifiers believed, were a strong propellant. They could push people to do actions they wouldn't normally do, and that, hopefully, was good. The most noble thing about Microsoft's version of Achievements, I always thought, was that Achievement points weren't redeemable. They unlocked nothing tangible nor anything virtual, at least in the sense of video game virtuality. They weren't a rewards program that got you a free sweatshirt. You couldn't buy them—though canny Achievers could buy horrible games that doled out easy Achievements. Your reward for Achievement was supposed to be that number and the social status elevation it afforded. Again, it was about bragging. And, again, I long ago stopped caring. I have been playing my games to enjoy what's in them, not what's around them. I didn't feel the need to brag about my gaming prowess to anyone. And then I played Nintendo's Super Mario 3D Land and discovered, as I sneered at other gamers' zeal for Achievements, that I had my owen nascent fantasy. Super Mario 3D Land, a new game from Nintendo on the 3DS that has no Achievements, applauds me. I don't remember a game ever triggering the sounds of applause when I did something well before, not in a way that manufactured the illusion that the act of playing a video game was a performance for an unseen crowd. Perhaps I've forgotten a classic that did. Perhaps this is an old idea. But for me it is a new favorite fantasy. I know, you must realize, that no human beings are aware of whether I've grabbed a batch a hidden coins in Super Mario 3D Land. No people are actually applauding. The fantasy is that, when I do something very well in the game, I hear applause. I like that. I like the back-pat, the 'atta-boy, the illusion that Super Mario inventor Shigeru Miyamoto is out there smiling somewhere because I just grabbed the coins before they disappeared. The Rock Band games did make their crowds more raucous and even had them sing along if you played virtual music well, but that was logical within the fiction of the game. Those games showed you in front of an audience. You were a guitarist or singer performing for them. Their crowds' positive, fake reactions were gratifying but unsurprising. The fantasy of the game already was that you were playing for virtual people. The Super Mario 3D Land fantasy is that there are people you can't see who care about what you are doing. They fill in for the people you might want to turn to, when you pull off a great move in a Mario game, and say: "Hey, look what I just did!" You can't see them, but the feeling is that they are there. 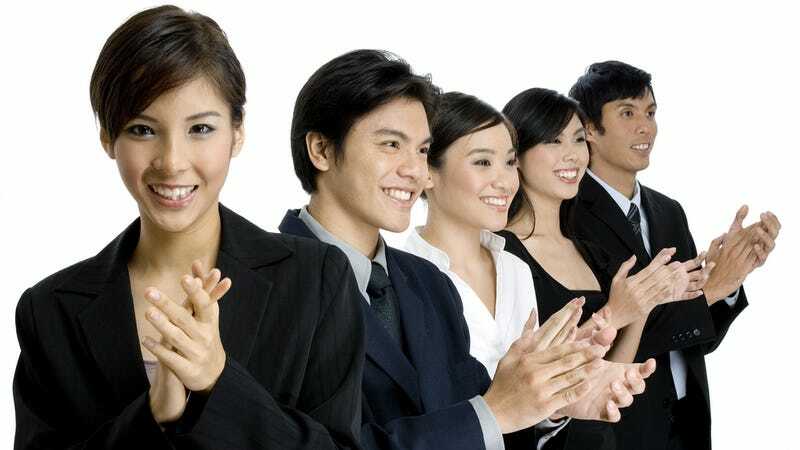 They just clapped for you because, damn, that triple jump you just did really was awesome. Most of all, I like the applause in Super Mario 3D Land because it is worth more to me than Achievement points. Achievement points are a mis-measurement and a false currency. They are numbers that don't actually count anything real. Applause is just… applause. It's not a number, just a sign of happiness, encouragement and appreciation. It's the kind of thing you might deserve for doing something well. It's the kind of thing you can cash in as earned praise. In Super Mario 3D Land, it is just virtual, but it sure is deserved. You're not applauded for everything you do; just for some of the harder stuff. Should this idea catch on, I'd enjoy even more refinement. Give me more applause for the really tough stuff. Give me a virtual standing ovation when I perform the near-impossible. And, sure, boo me each time I die. Just hold the points. And keep your badges.